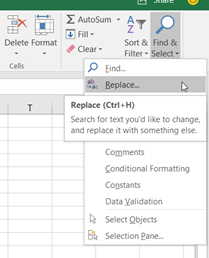 Excel’s Find & Replace feature (which you’ll find by clicking on the “Find & Select” button on the far right-hand side of the Home Tab) can be used in many ways… to replace names, codes, products, etc however one use that I’ve found for it is in sorting out some dates which weren’t really dates. 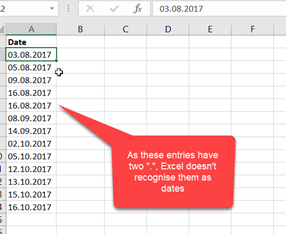 Unfortunately, this means Excel treated the entries as text, not dates. If it was one or two dates, it would have been quick enough to simply retype, unfortunately, there were lots hence the decision to use Find & Replace. The resulting entries are now all “real” dates. This entry was written by colinfoster, posted on April 9, 2018 at 4:41 pm, filed under Microsoft Excel, Tips and Tricks and tagged Excel, Spreadsheet. Bookmark the permalink. Follow any comments here with the RSS feed for this post. Comments are closed, but you can leave a trackback: Trackback URL.